What is an artist doing working in a cutting-edge science lab? That’s a question I hear almost every time I explain my summer internship at EpiBone. Fortunately, I feel my whole life has been preparing me to answer it. I have always sat firmly at the intersection between art and science. My best subjects in school were the visual arts and the natural sciences, a seemingly unlikely pair. Many people view art and science as separate entities, rarely intersecting, but yet, I constantly found myself exploring their connections anyway. In high school, I wrote an essay on how Vincent van Gogh’s mental illness influenced his artwork and, at the University of Pennsylvania, I began illustrating and designing the layout for Synapse Magazine, a student-run healthcare publication. However, with each of these endeavors, I felt as though I was only learning about art and science in parallel. Then, I was assigned to design the layout for an article called “Designer Bones,” and I discovered EpiBone. The title itself alerted me that creative thinking drove EpiBone, outwardly a hard-core biotechnology company that grows personalized bone grafts for implantation. To me, the scientists there were inventors, trailblazing a new route toward perfect-fit bone repair. I contacted Nina, and a couple of months later, in June, I began work as EpiBone’s first artist-in-residence, finally able to make the concrete connections between art and science that had eluded me previously. My newly imagined assignment as the artist-in-residence was to explore other applications of EpiBone’s bone reconstruction technologies — anything from product design to BioArt to bio-fabrication. Inspiration came not only from my extensive research on those fields, but from coronal CT scan slices from EpiBone’s pig studies. 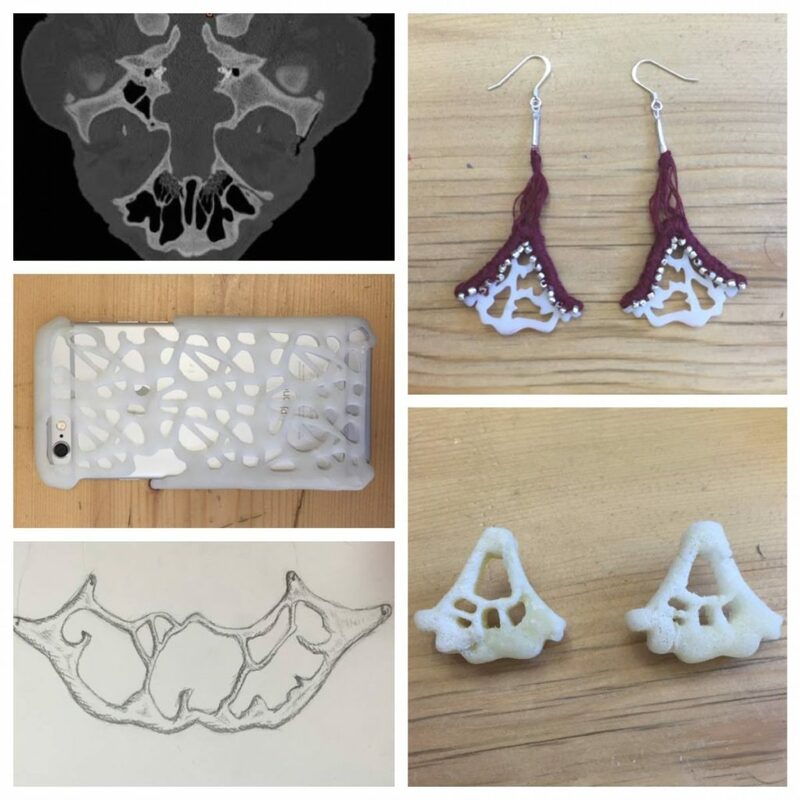 Examining those cross-sectional CT scan pictures, I began to formulate an idea: jewelry made from small and unique shapes evocative of these CT images, pieces that represented a different and artistic way to interpret scientific data. I had found a beauty in these scans that no one at EpiBone had considered before. Bone is beautiful in its own right: sturdy, intricately constructed and masterfully assembled. But when CT scanned and sliced, the patterns created by the bones in a pig’s skull can be reminiscent of abstract art. I was beginning to experience biology’s cleverness for myself. I was familiar with the concept of biomimicry, the idea that biology’s intelligence and beauty can inspire smart design. Mimicking the biological designs that, through millions of years of evolutionary remodeling, have been optimized for survival holds promise that inventors, artists and architects are already beginning to tap. To name a few examples, Norman Foster’s Gherkin Tower has an outer layer inspired by the hexagonal lattice exoskeleton of the Venus Flower Basket Sponge and scientists mimicked the toe pads of geckos to create an adhesive called Geckskin that can hold over 300kg. EpiBone’s bone tissue culturing process involves a lab environment similar to that of the human body to facilitate cell growth and differentiation. Working at EpiBone brought me closer to biological processes and structures, allowing me to develop a biomimetic design concept, inspired by the micro and macro-architecture of bone. With the advent of participating in the BioFabricate Conference in October of 2015, I also learned one can actually use biology to build. MycoWorks creates products such as panels and tiles out of mycelium. Modern Meadow is working on engineering “in-vitro leather” from mammalian cells. These inventors, along with many others, have partnered with biology to design and grow various materials and consumer products. And, at EpiBone, I had the opportunity to build with biology myself, making my jewelry designs out of decellualarized bovine bone. As I near the end of my residency, however, I’m starting to see that the interplay between biology and art is not so one-sided. Art can teach science, too. An artistic mindset is entirely necessary for scientific progress and innovation. The most intuitive example may be that artists are traditionally trained to draw only what they observe, without any bias. Scientists can learn from this power of observation; a mind attuned to detail may be able to navigate data methodically and carefully to isolate key elements. Artists are also taught to focus on the composition of the entire work to make it a cohesive whole. The broad focus encouraged in art may in turn encourage scientists to take a different stance when approaching research: to investigate how all parts fit together rather than concentrate on the function of one part. Above all, the creativity inherent in art and design is what is most applicable to science. Many say that scientific inquiry is completely objective while art is purely subjective. But, at their roots, art and science share a commonality: the necessity of creative thinking. “The arts and sciences are avatars of human creativity,” says Mae Jemison, a NASA astronaut and physician, and I completely agree. They are more alike than they are different, both dealing in the pursuit of some truth and both pushing boundaries to create something new. Creativity is the agent that allows us to discover and surpass these limitations. For example, when Keith, Ick and I tried to make my jewelry pieces out of decellularized bone, the shape of the jewelry revealed the limitations of the bone mill machine, which originally wasn’t able to cut the complex contours without compromising the integrity of the bone. Creativity helped us to brainstorm a way around these constraints. Science and art have always been kept so separate. Yet they have a strong symbiotic relationship. They are co-conspirators, helping each other to achieve something that neither could do alone. My experience at EpiBone has proved to me that art and science, biology and design can be combined; rather, they should be combined, for when they are, the results are truly innovative.